While doing business, what comes the first? Profit? But what brings profit? Good service? An excellent service with unhappy clients; will that work? So the ultimate thing in every business; be it B2B or B2C, is to satisfy customers. If you would ask Karl Marx, he would say that Customer Satisfaction is the base and all the other things are the superstructure. And here comes the importance of cloud based CRM solutions. CRM exists in the market since the early 1970s. But, it was a very high-hanging fruit for the small and medium scale businesses. Few of the technological things that have tremendously gained its ground since the last decades, CRM or Customer Relationship Management software, both for B2B and B2C businesses, is the torchbearer. Since the time when CRM applications were only accessed through computers; today, as we discuss, 48% of all the CRM application beneficiaries access to their smartphone; 45% of them access the application with their tablets. Among all the CRM application available online, Salesforce, especially for B2C businesses is by far the best of this kind. Yes. All these things Salesforce does and does the best among its contemporaries. 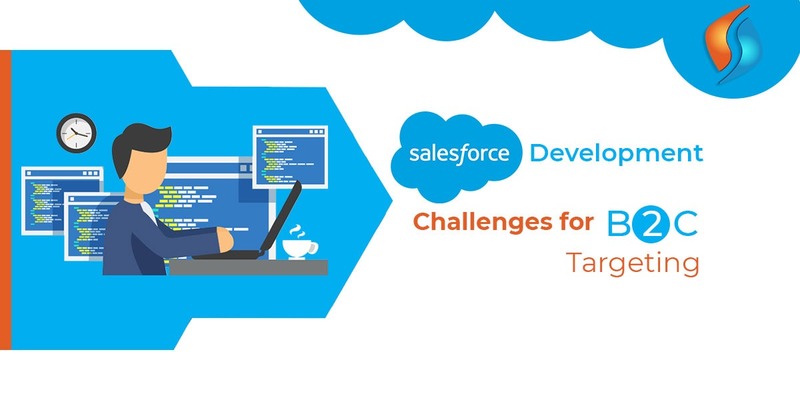 But, there is a nosegay of the challenges that every Salesforce Development faces for B2C development in comparison with B2B business protocols. The very concept of Customer Relationship Management had come into existence keeping B2B businesses in mind. It was no fault of the originators. The time this theory came into the contemporary market, B2C businesses were not so diverse that it could need a CRM application. But, things have changed. The unforeseen growth of B2C e-commerce has made Salesforce CRM an integral necessity of B2C as well. But the problem still exists in the root; the very approach of B2B and B2C businesses to their respective marketing and customer management is very different from each other. To put things very straight, B2B businesses run on direct profit parameters, there’s little to no chance of prioritizing the general emotion, problem-solving and personal 1 to 1 connection to the customers. And these exactly are the points on what B2C businesses keep largely their marketing going. All the CRM software is primarily designed to work for B2B businesses. Salesforce is trying to minimize the gap as far as possible. Now, what are the categorical challenges? More than 95% of the customers in B2C businesses that actually turns into sales were needed to be nurtured either from oblivious or afflicted stage. Any CRM application faces this problem as the approach to the sales funnel of B2B and B2C are completely distinct. Salesforce plays an excellent role in merging these two approaches. Running a successful business is all about getting the right data at the real-time and implementing that into strategy in the correct way. No more waiting for ‘batch-processed customer data’, Salesforce development is ever devoted in instant updating of real-time data to the users. What about the technical challenges? If you ask us, we’ll always recommend you to go for Salesforce CRM development. It’s not because they don’t face any problem. But the way they get over it is really distinct from the rest of the batch. Still any doubt? We’ll clear out! We, at Signity Solutions has a team of expert developers who can offer you the best Salesforce integration services. Hire our outsourcing team now! !